Reflections of a Journey is primarily the personal reflections of Lloyd F. Jackson, Jr., who joined the staff of the Virginia Baptist Mission Board in 1968, initially to lead the Royal Ambassador camps and boys’ activities, and across the years was given ever-widening responsibilities in the area of Baptist Men’s ministry including Disaster Relief. Although in official retirement from the Mission Board since 1997, Lloyd was involved in hands-on ministries through his church and as a respected consultant and leader in the area of disaster response until he passed away in 2016. Reflections of a Journey by Lloyd F. Jackson, Jr., is an engaging history of the development and work of missions-minded men through an organization which ultimately became known as Baptist Men and, in time, many of the individuals associated with Baptist Men began to participate in Virginia Baptists’ responses to ministry in places where disasters had occurred. The Disaster Response ministry has involved both men and women who have sought to be Christ-like servants to those in great need. The Baptist Men’s part of the story includes their ministry with you boys through the organization known as Royal Ambassadors, as well as the work with the Virginia Baptist camps: Camp Piankatank in the Eastern part of Virginia and Camp Peaks of Otter, a wilderness camp experience in the mountains. It also includes stories about practical hands-on ministry projects through Impact Virginia, World Changers, and Virginia Baptist participation in construction projects in Virginia and far beyond. The Virginia Baptist Disaster Response part of the story includes responses to natural disasters including most notable the aftermath of several devastating hurricanes and to the horrific disaster of September 11, 2001, and the tragedy at Virginia Tech in 2007. Among the responses has been the establishment of a feeding ministry that has operated out of portable kitchens. 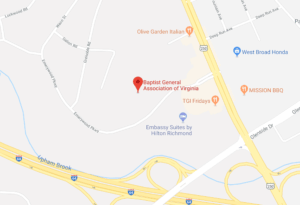 The ministry has involved numerous Virginia Baptist men and women. Reflections of a Journey is primarily the personal reflections of Lloyd F. Jackson, Jr., who joined the staff of the Virginia Baptist Mission Board (now BGAV) in 1968, initially to lead the Royal Ambassador camps and boys’ activities, and across the years was given ever-widening responsibilities in the area of Baptist Men’s ministry including Disaster Response. Although in official retirement from the Mission Board since 1997, Lloyd was involved in hands-on ministries through his church and as a respected consultant and leader in the area of disaster response until he passed away in 2016. Proceeds fromReflections of a Journey The Center for Baptist Heritage & Studieswill support Virginia Baptist Disaster Response and .